The cover soil of a non-sanitary municipal solid waste landfill was analyzed with respect to methane oxi-dation efficiency, oxidation rates, bottom and surface fluxes, thereby comparing hotspots of gas emission with non-emitting locations. The range of methods included in-situ approaches (gas push-pull tests, carbon mass balance, stable isotope fractionation) and exsitu methods (batch testing in the laboratory). The nature of the gas exchange through the cover soil was most relevant for the observed oxidation efficiency. 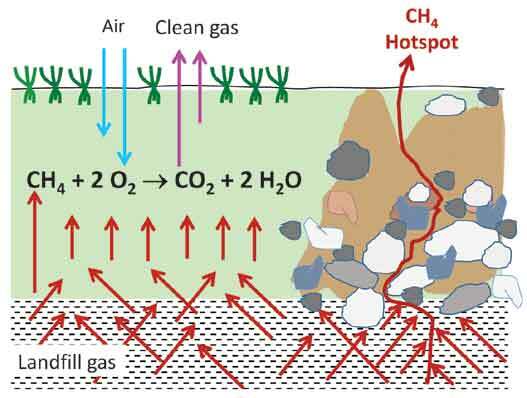 At hotspots, gas transport was predominantly advective, resulting in bottom fluxes as high as 1,028 g CH4 m-2 d-1, restricting methane oxidation to the upper crust of the soil due to impeded ingress of atmospheric oxygen. At these locations, significant emissions were observed, but also high oxidation rates of up to 240 g m-2 d-1. Contrastingly, over the greatest part of the landfill area gas transport through the cover was diffusive with usually complete methane oxidation and subsequently no emissions. In all cases, oxidation efficiency and the soil depths participating in the process were tightly related to the extent of soil aeration, suggesting the seasonal variation in soil moisture as a key variable. Batch testing in the laboratory reflected the previous exposure of the soil to landfill gas rather than the soil’s inherent oxidation potential. Compared to the in situ potential, soil sampling, pre-treatment and incubation in the laboratory yielded significantly lower values for the oxidation potential. For the given landfill, the carbon mass balance seemed to provide the easiest and most correct assessment for the quantification of methane fluxes to, through and from the cover soil.